Where To Find Half-Priced Food Deals In Dallas. The economy may slowly be showing signs of turning around, but that does't mean that it's a good idea to stop being frugal right away — not when there are so many ways to save a dime here and there and still get yourself a fine meal all around Dallas, on any given night of the week. It's no secret: A number of our favorite hangs in Dallas have long offered once-a-week dinner specials, be it with half-priced menu nights or buy-one-get-one-free deals. Everyone knows that. What's not always easy, though, is staying on top of who offers what deals and on what nights. To that end, we put in a little leg-work this week to find out which spots kindly offer their patrons a once-a-week cheap dinner option — and when. We called all of these spots to confirm that their deals are indeed still going. So, yes, they're all are confirmed — even the Friday and Saturday ones. Meaning? 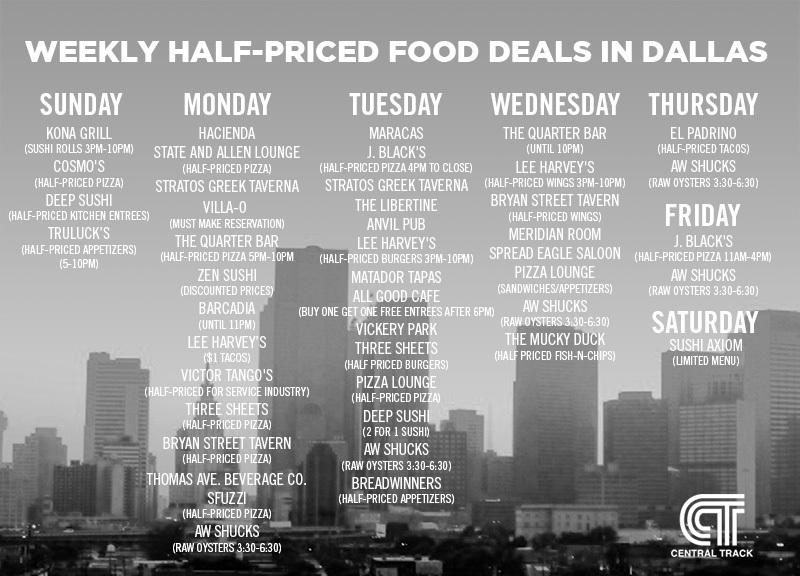 Yes, you can eat out on the cheap every night of the week in Dallas. No need to stretch that wallet any more than you have to.